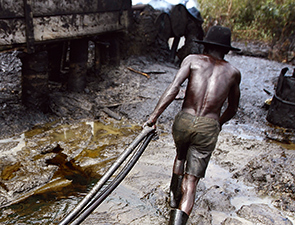 Crude oil theft and sabotage continued to affect our operations in the Niger Delta during 2013. This had severe social, economic and environmental implications. We are working with our sector, governments, non-governmental organisations and the international community towards ending the theft and sabotage. damage in the Niger Delta, Nigeria. During 2013, production was shut down many times to remove illegal connections to pipelines and make repairs. These shutdowns limit the environmental impact of theft and sabotage along SPDC’s pipeline network. However, it also reduces SPDC’s production leading to lost revenues for SPDC and the Nigerian government. SPDC continues to improve its infrastructure within this deteriorating security situation. This has led to a reduction in the number of operational spills from SPDC operations, which fell from 37 in 2012 to 30 in 2013. The volume of operational spills from SPDC operations increased to 0.4 thousand tonnes. Around 0.3 thousand tonnes of this volume was from a single spill. In 2013, the number of spills caused by sabotage and theft increased to 157, compared to 137 in 2012. However, the volume of oil spilled due to sabotage and theft decreased to 2.2 thousand tonnes. This decrease was due to intensified inspection of our facilities, including over-flights. Operational spills accounted for around 15% of the total volume spilled from SPDC facilities in 2013. A key priority for SPDC is to achieve its goal of no operational spills. In 2013, it continued work to maintain and replace pipelines and other infrastructure and, in the past three years, SPDC has replaced around 770 km of pipeline. SPDC continues to take further steps to improve oil-spill response and clean-up. Of 167 sites in need of remediation identified at the start of 2013, SPDC had cleaned more than 85% by the end of the year. In 2012, the International Union for Conservation of Nature (IUCN) set up an independent scientific panel, at the request of SPDC. Its goals were to identify improvements in SPDC’s oil spill clean-up and remediation practices, as well as the rehabilitation of biodiversity at oil spill sites in the Niger Delta. Its first report, published in September 2013, made specific recommendations for SPDC, the industry, government and communities to support rehabilitation activities. SPDC is working together with all parties involved to follow up on the Panel’s recommendations. In 2011, the UN Environment Programme (UNEP) published an Environmental Assessment of Ogoniland, a study of oil pollution in the Ogoniland region of Rivers State in the Niger Delta. The report was commissioned by the Nigerian government. SPDC has shown leadership by undertaking a range of activities related to the report in advance of the government, where it was able to do so. This included increasing community access to potable water in Ogoniland. SPDC has also investigated the 15 sites identified in the report and they have been remediated, where required, despite cases of recontamination from oil theft and illegal refining. The remediated sites have been certified by the local regulatory body as being compliant with both soil and groundwater remediation requirements. Another recommendation of the report was to verify the condition of non-operational equipment and facilities in Ogoniland. Due to more recent increased access to perform this verification process, SPDC has identified 125 additional sites in need of remediation. The Nigerian government will need to take the lead on co-ordinating other restoration activities in Ogoniland that were recommended in the report. However, a full clean-up is only possible when theft and illegal refining are contained. In 2013, SPDC’s total flared gas volume was reduced by 23% compared with 2012, in line with lower production. SPDC has delivered around 60% reduction in gas flaring intensity over the last decade and is reducing this further. Reductions in flaring are part of a long-term strategy and include a number of key projects. Once these projects are complete, SPDC flaring will be below current industry average. In 2012, SPDC announced additional investments of around $4 billion on projects to develop new oil and gas fields that will include gas-gathering facilities for fields that currently flare. These projects are heavily impacted by two factors that are not within SPDC’s full control: the external security situation and joint venture partner funding constraints. If left unresolved, it will result in delays to some of the projects that would help to deliver reductions in flaring over the coming years. However, SPDC remains committed to flaring reduction from its operations.